The fabric is wonderful, and hangs perfectly. The ruffle covers the top of my arms, and falls just right for a nice necklace. I really love this blouse . Perfect fit and so comfortable. 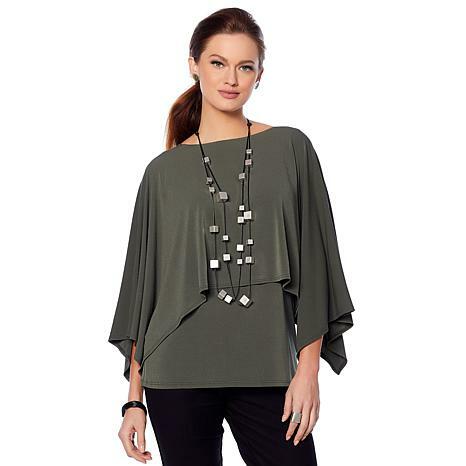 Love the style of this Capelet , Very slimming and comfortable. You can't go wrong, It is a real winner! I got this in four colors and was so pleased with the fit and how they feel. This is a BEAUTIFUL idea for a top and covers a multitude of problems I have. Hoping Marla brings this back in more colors, red is always a favorite. I love the color the style and the fit. Its flattering on and I love myself in it. True to size. Versatility of cape being worn to rear a plus. Fabric does not wrinkle. Unusual design getting compliments.